When was the last time you stopped and smelled the roses, as they say? Are you in the habit of appreciating what is in your life and looking at the positives? So many of us forget to appreciate the good and as such, life feels much more complicated than it need be. This month is about reminding you to appreciate the good stuff. It’s about looking at what is working well and praising yourself for your efforts. It’s about embracing those things that are going right for us. Sounds a little fluffy, but it’s actually very important. If we do not make time to appreciate the good stuff, we find ourselves far too focused on the not so good stuff and that doesn’t lead to a simple life at all. Besides, too much worry gives you wrinkles! Now get yourself a pen and paper and write a list of things you appreciate right now. At least 10 but more than 30 would be ideal. Okay… GO. I expect after taking the time to do that exercise you will be feeling a nice positive boost right about now and that’s exactly what taking time for appreciation can do for your every day life. Make it a regular habit from this point forward. 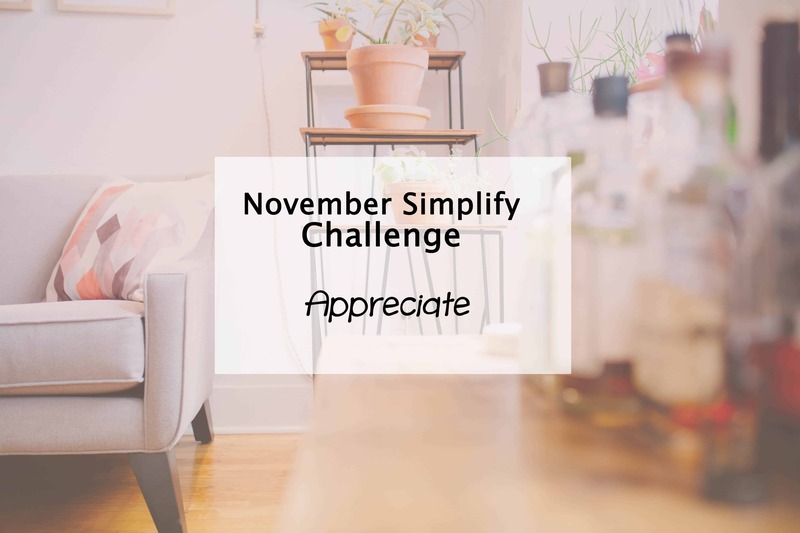 Don’t forget to pop over and check out all the other Simplify My Life tasks on the challenge page. Not long to go but never to late to join in. What is something you appreciate right now?